Winding roads surrounded by towering, rugged formations lead to one of the most visited and famous beaches of the island, the Pandawa Beach. An erstwhile hidden treasure behind the facades of intimidating karst cliffs, the rise of tourism has resulted in this becoming a popular spot. The beach takes its name from the five protagonists of the Hindu epic Mahabharata, called the Pandavas, making the island’s deep-rooted connections to Hindu mythology glaringly evident. Stretching across the coastline, the six alcoves carved in the humongous cliff faces shelter tall, white statues of the five Pandavas and their mother goddess Kunti. Calmly gazing over the lashing sea waves, the white statues are drenched in nuances of orange and red with the setting sun. Capturing the religious and mythological tenor of the island, the Pandawa Beach is awe-inspiring in more than one way. 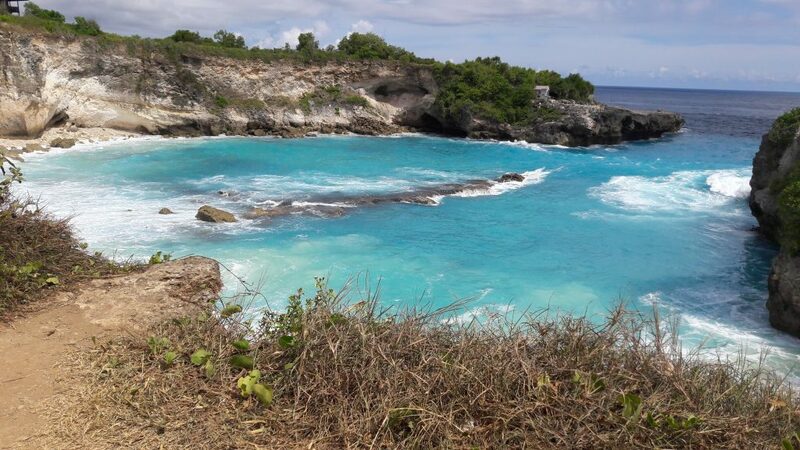 One of Bali’s best-kept secrets, the Blue Lagoon Beach on the eastern side is just as magical as its very name. Located close to the more recognized and commercial beach of Padangbai, the beach, concealed behind the verdure of forested hills, comes as a much-needed hideout to the seekers of tranquility. The spectacular, jewel-toned blue waters gently lapping the small, sandy strips entices snorkeling and diving enthusiasts to witness the abundance of marine biodiversity cradled inside. The sunbleached sand strip is ideal for those who wish to marvel quietly at its soothing allure. Singularly solidifying Bali’s buzzing, nouveau social scene, the Seminyak Beach is a contrast to the otherwise placid spots of the island. Forming an extensive and one of the largest shorelines, the vibrant beach strip is lined with some of the swankiest nightclubs and posh sea-facing resorts and villas. Dotted with swaying palm trees, the polychrome sun loungers serve as perfect therapy sofas for surfers looking to sip on a tasteful cocktail while savoring the serenity of the ocean. Bustling with life and conviviality, the Seminyak Beach is a colorful tapestry of an almost Californian flamboyance interwoven with the balmy ethos of Bali. 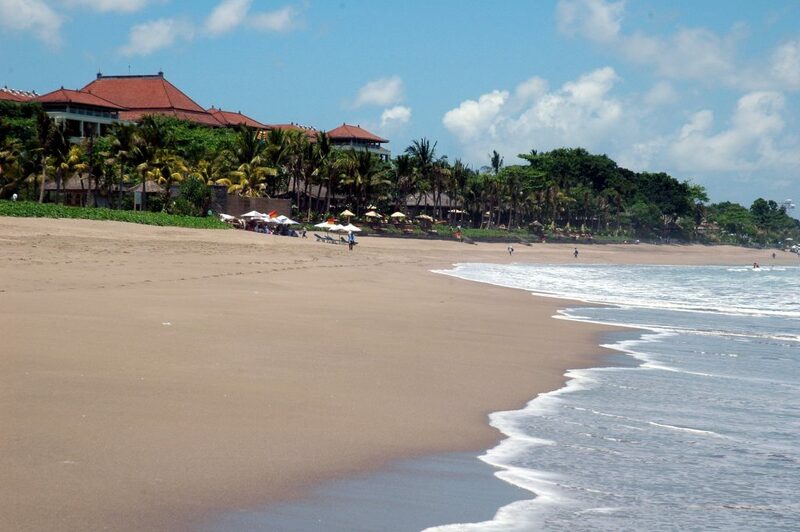 Among the many glimmering, white sandy beaches of the island, the Soka Beach in western Bali stands out as the black diamond. Set against the spectacular backdrop of lush green hills, the volcanic black sand shoreline of the beach is a beautiful anomaly. The village of Soka is a reflection of not only Balinese rural life but also its natural diversity, covered in rich rice fields and coconut farms. 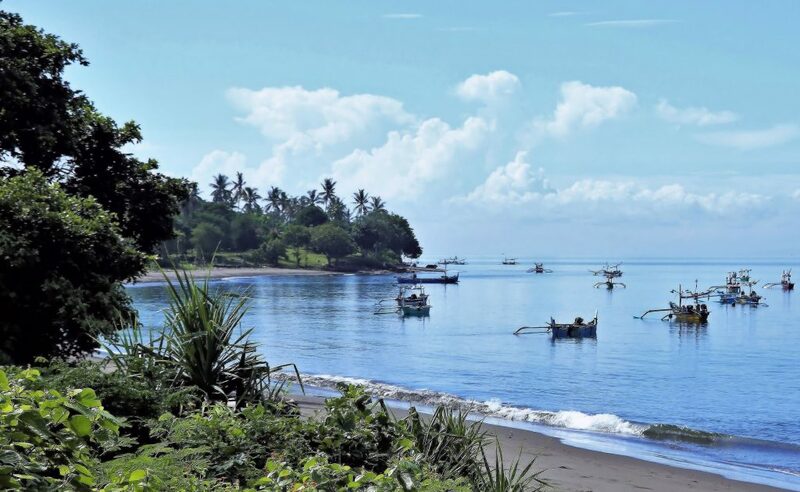 Even though the beach and the namesake village lie on the important Denpasar-Gilimanuk Highway, one will rarely see Soka vibrating with human activity. However, the beach is not totally devoid of it too. With a quaint cultural museum, a rustic beachfront villa and a couple of restaurants that will take care of the gastronomy, the Pantai Soka is ideal to enjoy the whooshing of the waves and the winds. 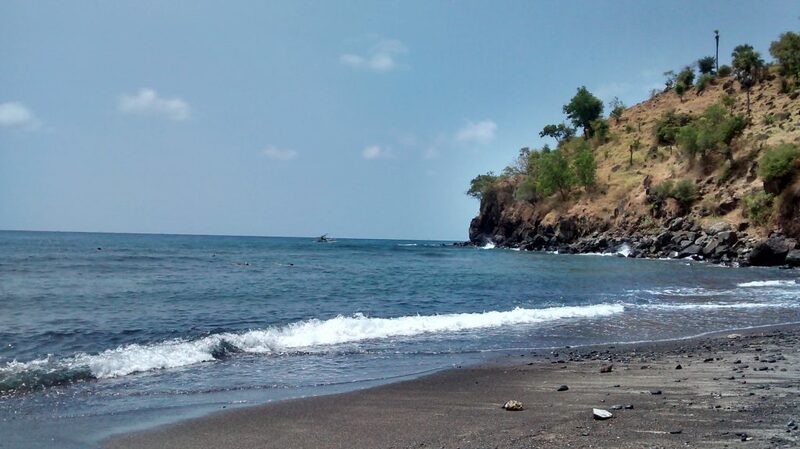 Another clandestine gem cushioned by these astounding islands, the Amed Beach balances its buoyant tropical essence made up of beach resorts and restaurants with a tranquil, black volcanic sand shoreline that opens up to the views of the majestic blue-green ocean. While the underwater coral reefs found near the beach waters have often hogged the spotlight, it is the Japanese Shipwreck that has been the talk of the town. 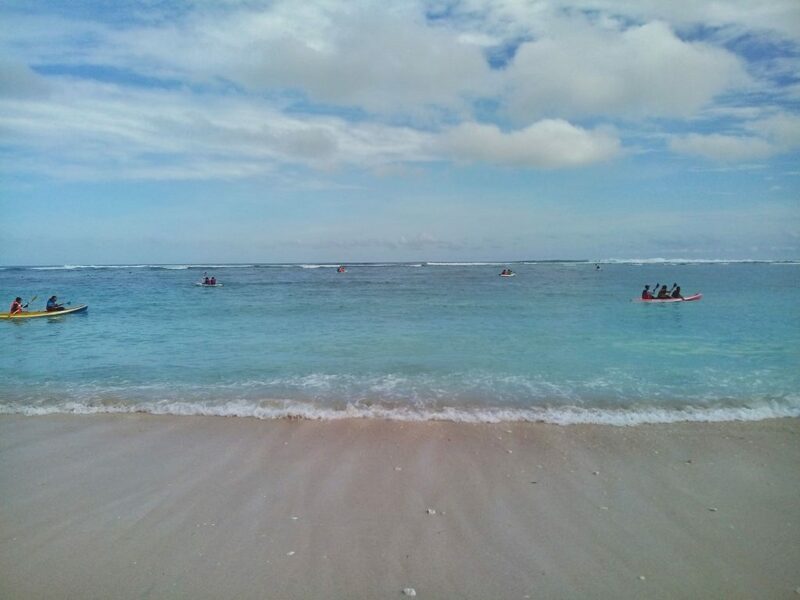 While the origins of the ship are unclear, the rather undisturbed beach has gained popularity as the starting point for snorkeling and diving excursions. Attracting thrill seekers and tourists in droves, the Amed Beach offers its visitors with adventure as well as a sense of peaceful serenity with its magnificent topography. Nature truly goes unbridled on these islands, leaving visitors spellbound with not only its beaches but also other natural solitaires found here. Even though the majority of Bali’s economy depends on tourism, it still remains a masterpiece which hasn’t fully been explored. Take a peek into the quaint lives of the locals here by cycling through the narrow alleys of Ubud or Denpasar and you may get a taste of local cuisine offered by the kind families in their homes. While the beaches may indisputably have most of your attention, it would be unfair to miss the mountainous coffee plantations and tasting tours carried out in the terraced green expanse. From luxurious resorts and nightclubs to an unpretentious local scene, Bali maintains a perfect equilibrium of traditions and modernity. A perfect depiction of what Bali has to offer.